1. 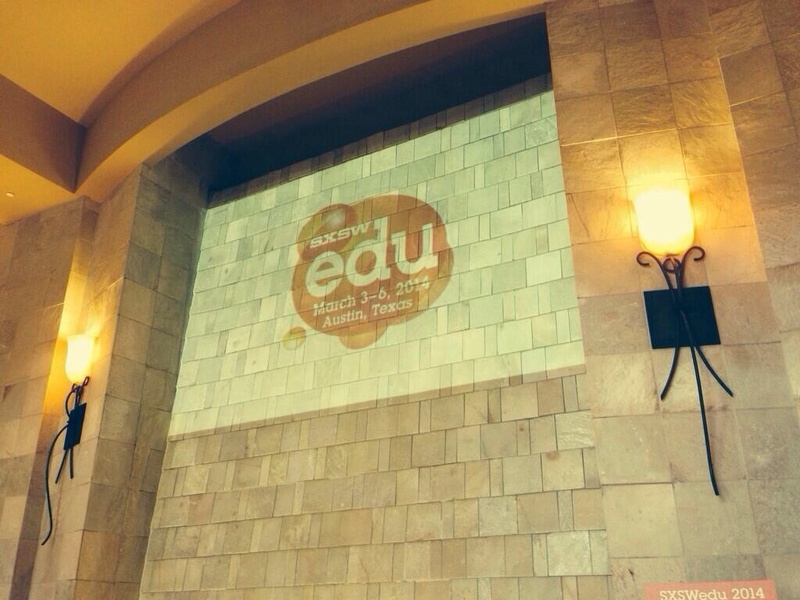 Being amongst so many like-minded, cutting-edge educators is always super empowering. It’s impossible NOT to be inspired. Just being around the people here is nearly enough. It’s like that old Garfield “Osmosis” poster I remember from high school. 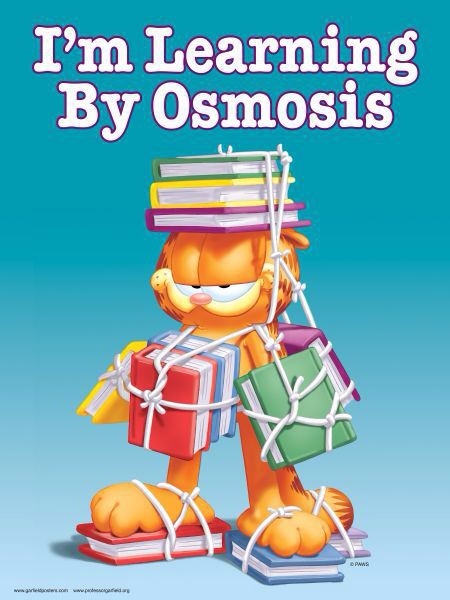 Yes, I’m learning by Osmosis. 2. 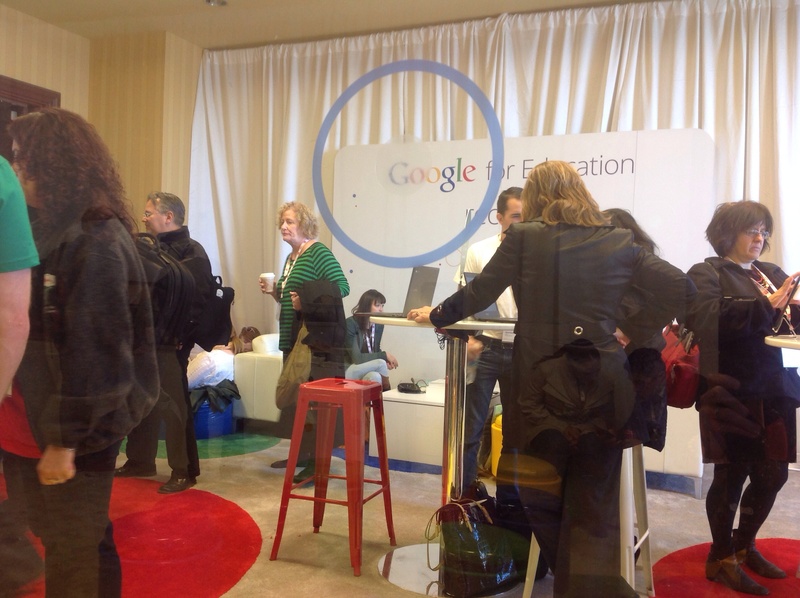 I geeked out like a Fanboy in the Google Lounge. Yes, I’m a sucker for environment and cool decor. I kind of want a room like this in my school now. I also chatted with a gentleman who teachers a comic literacy course in Georgia – it’s funny how you can tell immediately that someone is a great teacher, and Brennan Collins is one of them. It was just the way he spoke with shrugged shoulders how he has no idea what mediums his students use to create projects and that he only has to evaluate them…yeah, that was really cool. He gets it. We also chatted about my love for The Amazing Adventures of Kavalier and Clay – check it out if you haven’t. One of my faves. Also chatted with a guy from EduBlogs – a blogging platform that seems simpler and more EDU-friendly than Blogger, but certainly way more powerful and authentic than something like Kidblog. My main takeaway (and this is a cool idea worth investigating further): wouldn’t it be awesome for students to maintain a running reflective blog throughout their K-12 experience? Imagine the practical value and empowerment built from this MASSIVE digital portfolio. I’m in love with this idea and will investigate further. 3. Mike Kleba presented solo in a session entitled, “Teachers: Undiscovered Entrepreneurial Rock Stars” – and he nailed it. One of his main messages was that teachers need to be the ones modeling and engaging in the sorts of activities that we expect from students. This has been a big thing for me recently – driving innovation and change is less about the nuts and bolts of practical technology management and direct curriculum tie-ins (although this IS important, don’t get me wrong) – but it’s more about building the culture of sharing and connectivity. And teachers should be doing it themselves and modeling it for the students. It’s important. Mike also stressed that, currently, “Teachers aren’t at the heart of innovation of change.” This needs to change. We need “boots on the ground,” as Mike puts it. Teachers are the ones in the trenches everyday, so how come we fall victim to ideas and products that have little to no teacher input? Companies and HR departments need more DIRECT teacher input, and innovative education and student learning will directly benefit. Mike was a really cool speaker – great delivery. I recommend. 4. Looking for some ways to shake up Professional Development, I attended a session “Innovation Bootcamp for Educators.” It took an entrepreneur slant in creating and selling ideas, and I have to say, it made sense. I felt a little like Jordan Belfort from The Wolf of Wall Street. Not that I’m planning on scamming anyone (I’m NOT), but really, aren’t we pretty much selling innovation in schools right now? And when we sell, we need to be practical, thoughtful, transparent, and consider all the parties – teachers, Board members, students, the community, etc. The session recommended not getting caught up in the solution but really working hard at selling to the various stakeholders through the steps BEFORE the solution. So I’ll be thinking about PD a little differently now – not totally like a salesman, but I’ll be more thoughtfully considering the ideas of using storytelling and pitch-creating to enact the innovative change we’re all looking for in education. As much as we don’t want to admit it, we all love a good salesman, right? 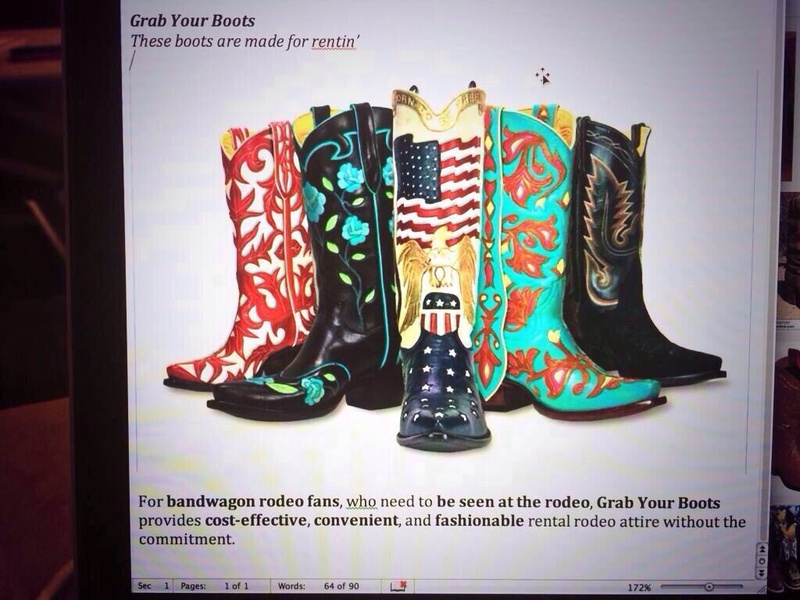 Random note: I was working in a group on developing a fake product (my group members came up with rental cowboy boots for rodeos; my only contribution was the tagline: These boots are made for rentin’) – and I noticed my group’s work popping up on my Twitter feed. Yep, I’d been following one of our group members on Twitter for some time. I thought his face had looked familiar to me..it was Nick Punt of EdSurge. Funny and random moment – I love Twitter. 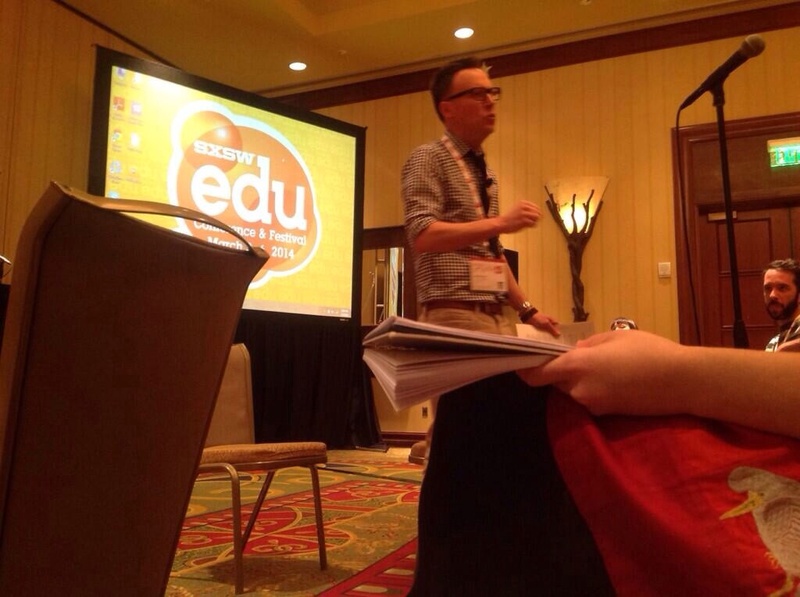 Next Post SXSWedu Day 2 Recap!